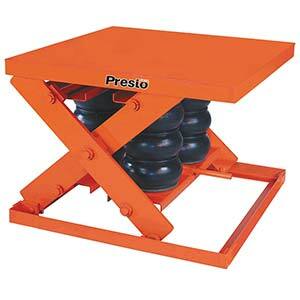 Heavy duty pneumatic scissor lifts use shop air to position loads at an efficient work height. They eliminate bending, stretching, and straining to increase productivity and reduce injuries. Use lift tables in manufacturing, machining, shop, and assembly operations. Place them next to conveyors to allow workers to quickly and easily work at the exact right height for the job. Standard pedestal controls allow easy raising and lowering of loads, and the airbag system needs less maintenance than electrical or hydraulic lift systems. Operation requires an air supply of 80 psi @ 15 cfm. No floor lagging is necessary for heavy duty pneumatic lifts. PRST-AXS2-3648 2000 36" x 48" 36" 12"
PRST-AXS2-4848 2000 48" x 48" 36" 12"
PRST-AXS2-4856 2000 48" x 56" 36" 12"
PRST-AXS2-4860 2000 48" x 60" 36" 12"
PRST-AXS4-3648 4000 36" x 48" 36" 12"
PRST-AXS4-4848 4000 48" x 48" 36" 12"
PRST-AXS4-4856 4000 48" x 56" 36" 12"
PRST-AXS4-4860 4000 48" x 60" 36" 12"
PRST-AXS6-4848 6000 48" x 48" 36" 12"
PRST-AXS6-4856 6000 48" x 56" 36" 12"
PRST-AXS6-4860 6000 48" x 60" 36" 12"
PRST-AXS8-4848 8000 48" x 48" 36" 12"
PRST-AXS8-4856 8000 48" x 56" 36" 12"
PRST-AXS8-4860 8000 48" x 60" 36" 12"